Our first Archivist – Edmund O. Hovey! Well, that is what we might call him today. But in 1832 he was a jack of all trades – minister, science faculty, the Advancement department, building and grounds manager and, in his spare time he preserved the earliest bits of Wabash history. Today you can see his archives and read all about the struggles involved in starting a college in the wilderness. And it all comes to your device wherever you are thanks to Lilly library Cataloger Brian McCafferty. Hovey’s letters and his even more amazing scrapbook are now online and searchable. 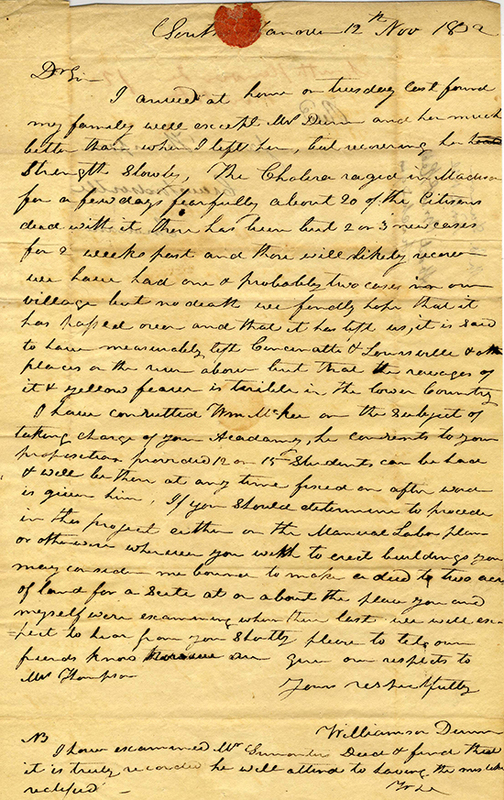 This letter may be seen at the link above along with loads of other letters detailing the trials and tribulations in the pioneer days of Indiana. Fundraising in the east, reaching the “point of desperation” and triumphing over illness, the death of friends and colleagues and even watching your college catch fire and burn. All these and more are contained in the Hovey Letters collection. This page contains Hovey’s notes on the first meeting where the idea of a college in the Wabash Country was widely agreed upon and the donation of land from Williamson Dunn sealed the deal. These two projects contain within them the Archives of Wabash College from its founding until Hovey’s death in the 1870s. A real look at events that often feel more like myth. The founding of a college in what was still the wilderness was a brave, bold move and nearly 190 years later, it is still going strong. I think the founders would be pleased to see what became of their humble start.